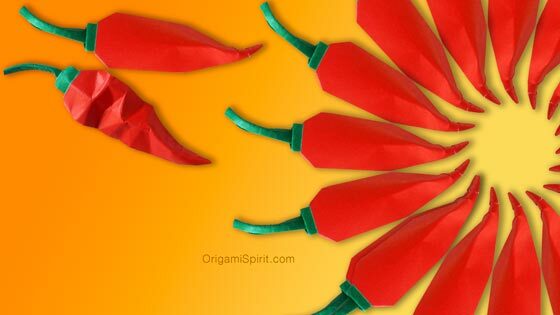 Whether you make one origami skull or a whole family of origami skulls, you’ll enjoy the options for dressing them up to celebrate either the Day of the Dead or Halloween. Día de los Muertos (Day of the Dead) commemorates and honors the lives of departed love ones and welcomes the return of their spirits. It is celebrated on November 1st (All Saints Day) and 2nd (All Souls Day), roughly the same date that Halloween is celebrated in the United States. The Day of the Dead is celebrated by many in Latin America, specially in Mexico and Central America. It’s also celebrated by Mexican Americans in the United States. A popular tradition on the Day of the Dead is the making of colorful sugar skulls used as offerings on altars in remembrance of the departed. The following step-by-step video shows how to make an origami skull of my own creation. I’d like to express my appreciation to Karen Buse whose work inspired me to create these origami skulls and arrangements. The finished origami skull shows both sides of the paper. It’s best to use thin paper paper; white on one side, black or dark on the other. Paper known in the US as “kami” is an excellent choice. The origami skull can be made with white office paper partially colored on the reverse side. The video shows how and when to apply color. Before folding, you can decorate the paper with floral motifs and patterns. The model folds flat. After folding place under a book to flatten it. You can use it in a greeting card! To embellish your origami skulls and give them personality, you can add accessories such hats, bow ties and flowers. Thank you very much Leyla ! Oh Leyla, you have taken this idea to a whole new level! So very cute and creative. I am so happy the la señora now has el señor to keep her company in the afterlife! Delightful! Your site is so amazing–thank you so much! Si es la primera vez que tratas de hacer una figura en origami, seguramente te va a ser algo difícil. Cuando ya tengas más experiencia con la papiroflexia puedes intentar hacer la calavera de nuevo. ¡Me encantan, Leyla! No sólo las ‘calacas’, sino toda la preciosa composición que nos estás regalando para el ‘Día de todos los Santos’. Que tengas un buen día. I’m make for Halloween here in Brazil. Could you teach us how to make the Cat Box?? Il would be great to fill in with candies and give for the children’s at the door! Love the skulls, just in time for Halloween. Will the hats be available soon? Rest of the site brilliant as well. Thank you for all your hard work! Thank you John, all origami accessories for the skull will be out as videos before the end of October. “muy bueno”, would that be right? I get bits and pieces from helping my kid with flashcards…. Thank you Rose for your “muy bueno”, which is perfect Spanish! Absolutely beautiful! Mistress Leyla again gives show of talent and creativity! Thank you! Previous post: A Quick Origami Rose, a Variation and a Leaf –Three in One!